Stand out and get noticed with Laser Sheen® Show-Stopping Shampoo. This luxurious shampoo penetrates deeply for a flawless clean coat that leaves your horse with a dazzling shine from head to tail. Vitamin E and PABA sunscreen help protect the skin and hair from bleaching, wind, weather and sun. Wet the horse's coat, mane and tail thoroughly with water. 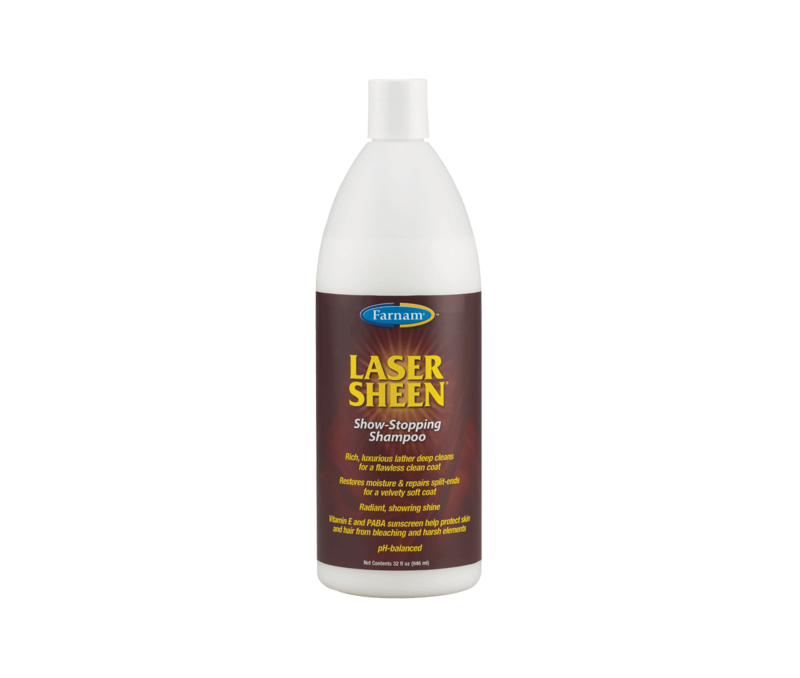 Apply a sufficient amount of Laser Sheen® Show-Stopping Shampoo onto a sponge and massage into a rich lather over the horse's entire body, including mane and tail. Let lather stand for 2-3 minutes. Rinse horse thoroughly with clean running water. Remove excess water with a sweat scraper and dry horse as desired.